Perhaps no one would be more surprised than C.S. 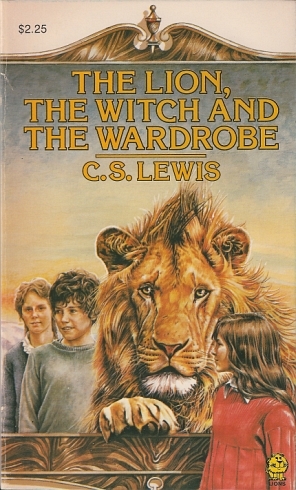 Lewis himself at the success of his classic children’s stories, The Chronicles of Narnia. 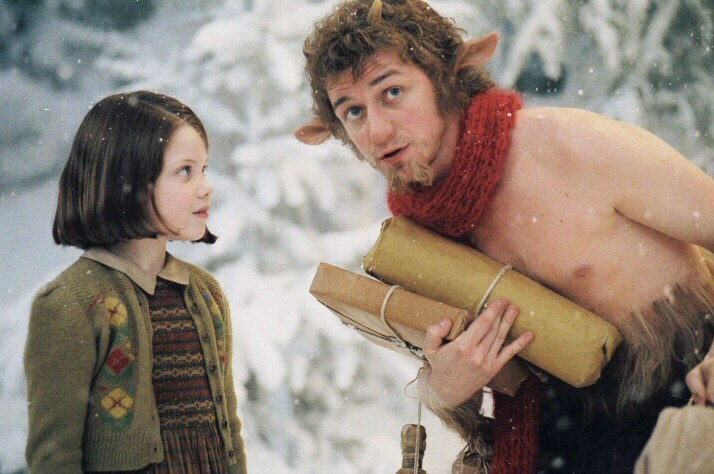 Hundreds of millions of copies of the Narnian tales have been sold, and they are read and reread by children and adults everywhere. It won’t be surprising that C.S. Lewis’ Christian worldview emerges in Narnia, though some (like a character in one of Neil Gaiman’s stories) can feel betrayed by this emergence. For some, the Christian ideas break into a world and destroy the art and beauty. For others, they assume that Lewis began with a Christian message and squeezed a story around it. 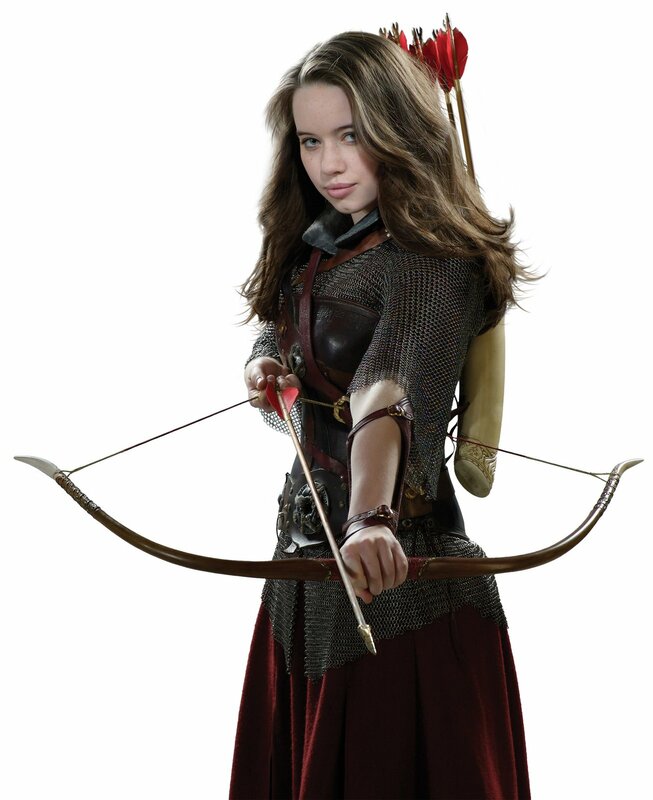 And there are some that read Narnia only for that message. But for Lewis, it was a much more complex and organic project. He speaks a bit about it in “On 3 Ways of Writing for Children” in the essay collection, Of Other Worlds. Any reader of Lewis will need to know J.R.R. Tolkien’s essay, “On Fairy Tales.” But Lewis also shares some of his process of writing in an article in The New York Times, Nov 18, 1956. Here is the bulk of what he said (also in Of Other Worlds and On Stories). was also a man and a citizen in that capacity he ought to, and would wish to, make his work edifying as well as pleasing. Now I do not want to stick very close to the renaissance ideas of ‘pleasing’ and ‘instructing’. Before I could accept either term it might need so much redefining that what was left of it at the end would not be worth retaining. All I want to use is the distinction between the author as author and the author as man, citizen, or Christian. What this comes to for me is that there are usually two reasons for writing an imaginative work, which may be called Author’s reason and the Man’s. If only one of these is present, then, so far as I am concerned, the book will not be written. If the first is lacking, it can’t; if the second is lacking, it shouldn’t. In the Author’s mind there bubbles up every now and then the material for a story. For me it invariably begins with mental pictures. This ferment leads to nothing unless it is accompanied with the longing for a Form: verse or prose, short story, novel, play or what not. When these two things click you have the Author’s impulse complete. It is now a thing inside him pawing to get out. He longs to see that bubbling stuff pouring into that Form as the housewife longs to see the new jam pouring into the clean jam jar. This nags him all day long and gets in the way of his work and his sleep and his meals. It’s like being in love. merely literary sense, but ‘good’ all around. This may sound rather complicated but it is really very like what happens about other things. You are attracted by a girl; but is she the sort of girl you’d be wise, or right, to marry? You would like to have lobster for lunch; but does it agree with you and is it wicked to spend that amount of money on a meal? The Author’s impulse is a desire (it is very like an itch) and of course, like every other desire, needs to be criticised by the whole Man. Let me now apply this to my own fairy tales. Some people seem to think that I began by asking myself how I could say something about Christianity to children; then fixed on the fairy tale as an instrument; then collected information about child-psychology and decided what age-group I’d write for; then drew up a list of basic Christian truths and hammered out ‘allegories’ to embody them. This is all pure moonshine. I couldn’t write in that way at all. Everything began with images; a faun carrying an umbrella, a queen on a sledge, a magnificent lion. At first there wasn’t even anything Christian about them; that element pushed itself in of its own accord. It was part of the bubbling. Then came the Form. As these images sorted themselves into events (i.e., became a story) they seemed to demand no love interest and no close psychology. But the Form which excludes these things is the fairy tale. And the moment I thought of that I fell in love with the Form itself: its brevity, its severe restraints on description, its flexible traditionalism, its inflexible hostility to all analysis, digression, reflections and ‘gas’. I was now enamoured of it. Its very limitations of vocabulary became an attraction; as the hardness of the stone pleases the sculptor or the difficulty of the sonnet delights the sonneteer. On that side (as Author) I wrote fairy tales because the Fairy Tale seemed the ideal Form for the stuff I had to say. Then of course the Man in me began to have his turn. I thought I saw how stories of this kind could steal past a certain inhibition which had paralysed much of my own religion in childhood. Why did one find it so hard to feel as one was told one ought to feel about God or about the sufferings of Christ? I thought the chief reason was that one was told one ought to. An obligation to feel can freeze feelings. And reverence itself did harm. The whole subject was associated with lowered voices; almost as if it were something medical. But supposing that by casting all these things into an imaginary world, stripping them of their stained-glass and Sunday school associations, one could make them for the first time appear in their real potency? Could one not thus steal past those watchful dragons? I thought one could. That was the Man’s motive. But of course he could have done nothing if the Author had not been on the boil first. one from being patronising. I never wrote down to anyone; and whether the opinion condemns or acquits my own work, it certainly is my opinion that a book worth reading only in childhood is not worth reading even then. The inhibitions which I hoped my stories would overcome in a child’s mind may exist in a grown-up’s mind too, and may perhaps be overcome by the same means. concepts or even experiences but whole classes of experience, and to throw off irrelevancies. But at its best it can do more; it can give us experiences we have never had and thus, instead of ‘commenting on life’, can add to it. I am speaking, of course, about the thing itself, not my own attempts at it. ‘Juveniles’; indeed! Am I to patronise sleep because children sleep sound? Or honey because children like it? This entry was posted in Creative Writing, Fictional Worlds and tagged books, C.S. 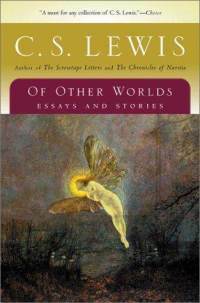 Lewis, children's stories, fairy tales, fantasy, J.R.R. Tolkien, lion the witch and the wardrobe, literature, Lord of the Rings, myth, mythmaking, mythopoiea, Narnia, Neil Gaiman, The Chronicles of Narnia, writing. Bookmark the permalink. A problem nowadays appears when people start off telling a really great story but then feel compelled to shove in various aspects of the spirit of the age or the in vogue PC cause(s). I’m not so bothered about it when it fits organically into the story, though. Then whether I like it or not, it’s good story-telling. Anyway, this has always been one of Lewis’ best pieces. Very good advice for writers and I think in particular for Christian writers. I like this piece too, though I doubt anyone in New York knew Tasso in 1956! When a story is forced, it is almost always bad. It is a great piece, and I loved that chat. I was jealous that Holly got to it before me, and glad you linked it. Hello, is this the full article that you reproduced? Thank you for your blog anyway, it’s great. Thanks. Many of your posts on your blog have been useful for the essay I’m writing on Lewis’ The Magician’s Nephew. Howdy! 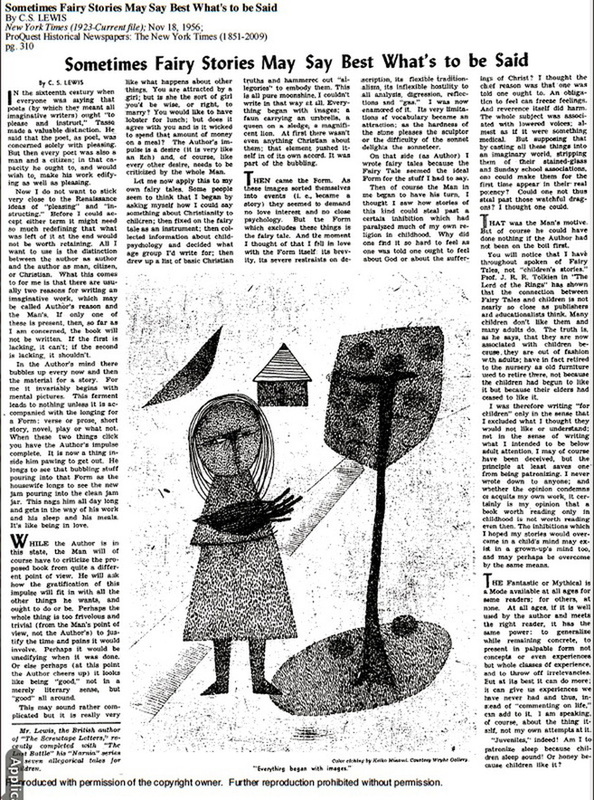 I have two of these on my blog, this picture from NYT and “3 Ways of Writing for Children”. The latter I linked back to the SatEvePost and they retweeted. But as a Canadian, my own prepared text is in the public domain. This picture, I’m not sure about. I took it from a simple image search and linked it to NYT originally. btw, I’m looking at your Greek for Kids kit. I’m teaching my son biblical Greek but it is slow going. The concepts of grammar are quite high. I thought I might start in classical for kids. Yes, I love this piece!